I made this video because one of the users at the Animation Master forums, “thejobe”, was in the process of creating an animated short but he was having a lot of trouble trying to install the A:M 2008 Rig into one of his characters. You can learn more about his project here. thejobe’s name is Jason and not very long ago he created an airplane hangar model for me at my request. In fact Jason has made quite a few model at the request of a few users at the forums. I think that Jason using his time to help other users at the forum is commendable and since I know a little about rigging I felt that I should help him when he actually asked for some help for himself. I intended to get this video on to my web site in August of this year at the same time that I rigged his model but I was interrupted by a heavy dose of real life. Nothing bad or anything like that but I had to deal with some other matters. This video is almost 3 1/2 hours and I will break this video up into smaller sections at some point to make it a bit easy to navigate each of the sections. There are also supplemental videos that are part of this that I ‘ll post at a later date. I cut them out of this video to try to keep the running time down. 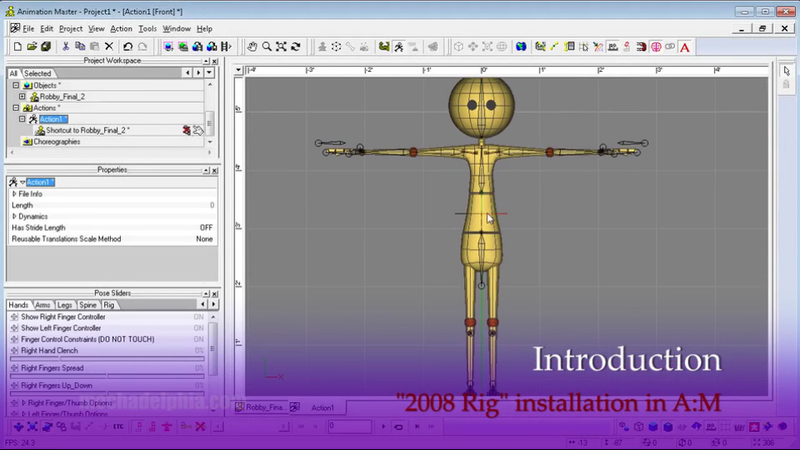 Anyway, I’m happy to finally get this tutorial on installing the Animation Master 2008 Rig out for you. I hope that you find it helpful. You’re very welcome. I’m glad that you found it to be helpful. I finally got to watch the video. long one in deed! i want to thank you again for your help! as for the model the animation is almost complete and will be available on the forums for viewing soon. the short is called Santa’s Little Helper.